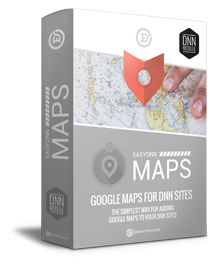 Google maps to your DNN site. Google Maps is a popular web mapping service. It offers a lot of functionality, but it is not always easy to use and adjust. 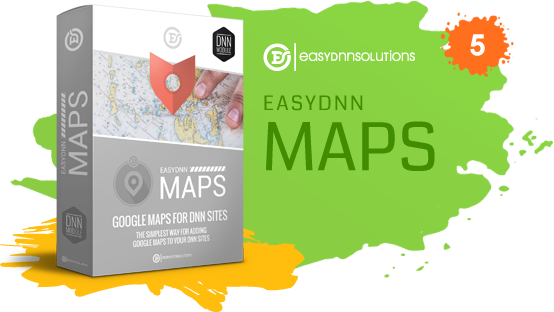 EasyDNN Maps is a DNN module that enables implementation of fully-customized maps on DNN sites. Adding location markers, fine adjustment of maps, filtering maps by categories, store locator, driving directions, and Street View are only some of the functions that you can easily use with this module. 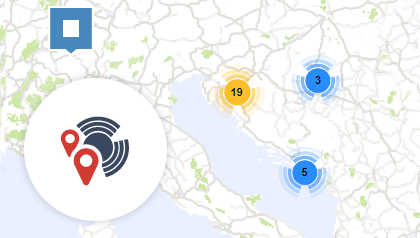 Particularly interesting is the possibility to connect it with the EasyDNN News module, and display locations from posts on a map. Let’s also mention Category Widget that enables filtering of locations by categories. 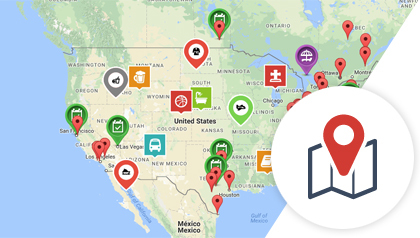 Add Google Maps to your site quickly and easily. 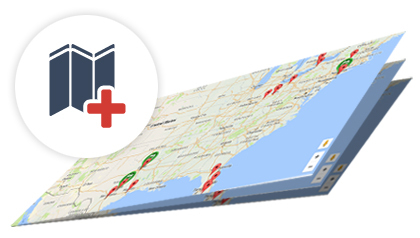 Add an unlimited number of markers to your maps. 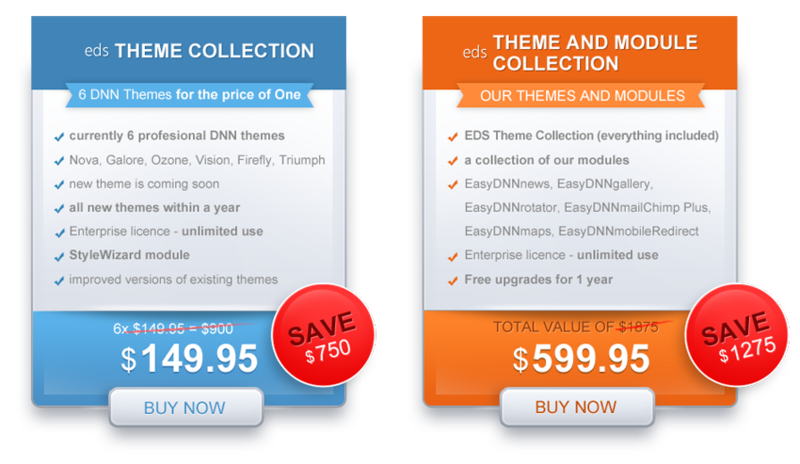 Choose between more than 7,000 icons that come with the module. Upload and use your own custom icons. Add a category widget to the map. Each category can have its own icon. Additional information about a location can be seen in an info bubble. The layout of the info bubble can be adjusted in the HTML template. Display more markers in the same place as a clustered marker. Enable filtering of markers by location. Set the starting position and zoom level. 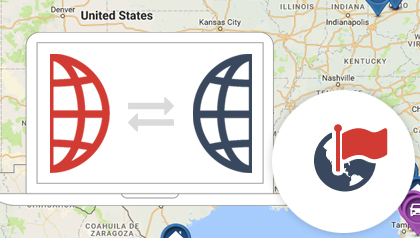 100% responsive maps that work on all devices. 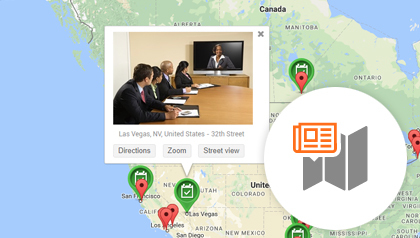 Enable visitors to see a location as street view. Detect user location, if possible. Find all locations within a radius. Display locations from EDN posts from different portals. Displays all locations from posts on a map. Clicking on Read More in the info bubble opens a post details page. When a post details page is opened, the map centers on the location of the post. 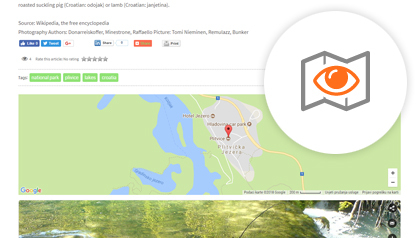 Offers the possibility of displaying or hiding maps in a post list and post details page. Connects the categories from the EasyDNN News module with categories in the EasyDNN Maps module. Displays custom fields from the EasyDNN News module in an info bubble. Displays on a map only locations that match the search results. 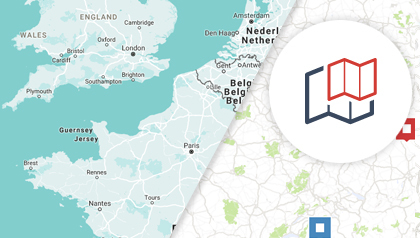 With the help of this module, you can create an unlimited number of Google Maps for your site. It is also possible to add more maps to the same page. Maps are fully responsive, and thanks to numerous options in the settings, it is possible to adjust the desired behavior for maps (e.g. set a default position, zoom level, etc.). Easily add locations (markers) using the map editor. 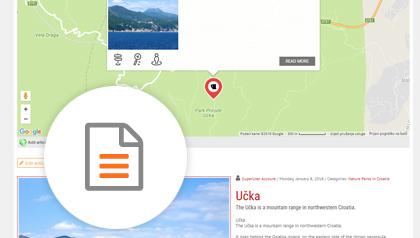 Add a title and description to your locations using the HTML editor. The descriptions are displayed in an info bubble when you click on or hover over a marker. 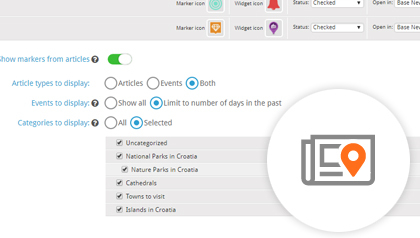 The module comes with 7000+ icons that you can use as markers for categories. It is also possible to upload your own icons. 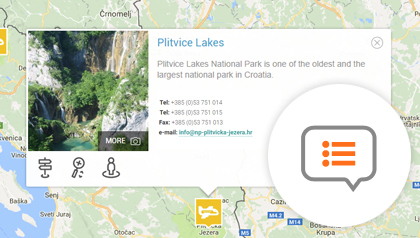 The information about the location is displayed in an info bubble when you click or hover over a marker. The layout of the info bubble can be adjusted in the HTML template. Locations (markers) can be organized into categories, allowing you to filter by location. Display the list of all the locations below the map. 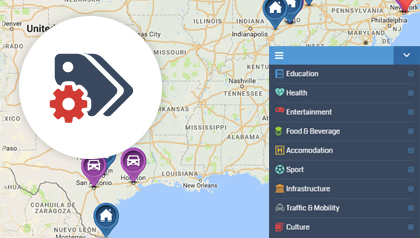 By clicking an item in the list, the selected location on the map is opened in the info bubble. The layout of the list can be adjusted in the HTML template. By organizing markers into map clusters, you can display more markers on the same location. Depending on the zoom level, markers are grouped in a cluster or displayed as individual markers. The module enables displaying of different map layers. You can select traffic, transit and bicycle layers in the module. You can also upload custom KML/KMZ layers. It is also possible to add custom map styles from Snazzy maps. The Street View button can be displayed in the info bubble. 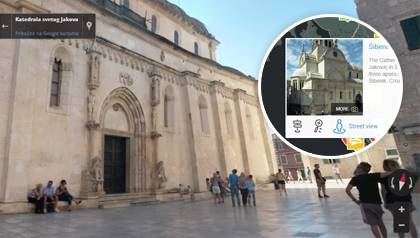 By clicking the Street view button, a visitor can enter into street view when such view is available for the location. 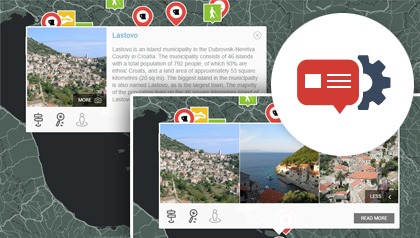 The module can be set to immediately display a Street view of the location. The Directions button can be displayed in the info bubble. 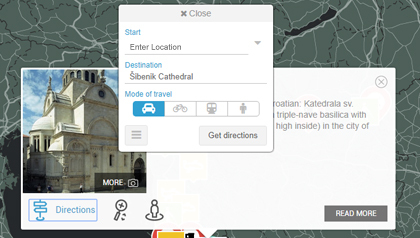 By clicking the button, visitors will get directions from their location to the location on the map. Filter the locations within a certain radius with the radius slider. For example, find petrol stations within the radius of 100 miles. This functionality is also known as a store locator. This module can be used on multilingual websites. It is possible to add location descriptions in multiple languages, and the correct version for the selected language will be displayed. It is also possible to translate the module interface. 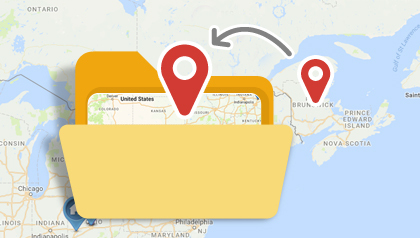 You can add location markers in the module interface, or import them from KML, KMZ, or CSV files. Thanks to the built-in map editor in the EasyDNN News module, you can add locations in posts. 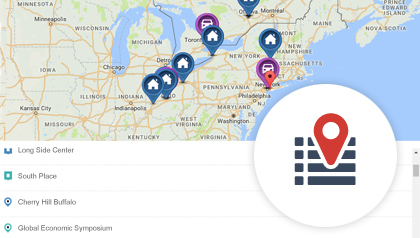 The EasyDNN Maps module can then display locations from the posts as markers on a map. Additional information about markers is shown in an info bubble whose content is possible to customize with tokens. Introductory text about locations from posts is displayed in an info bubble. Clicking Read More opens a full post. Posts in the EasyDNN News module can be blog articles, events and all kinds of property listings, company pages, tourist locations and more. When opening a full post page, the map centers on the location from the post and the location's info bubble is displayed. When the EasyDNN Maps module is added to a page together with the EasyDNN News module, the map can be visible or hidden, depending on whether it is a list of posts or a post details page. In such a way, a map can be shown in a list of posts or hidden in a details page. All combinations are possible. In EasyDNN News, posts can include additional information such as addresses, emails, phone numbers or working times. To add additional information, custom fields are used. Data from these custom fields can be displayed in an info bubble with tokens from the EasyDNN News module. Posts in the EasyDNN News and Locations (markers) in the EasyDNN Maps module can be organized into categories. 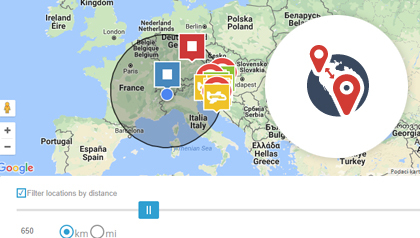 By using the Category Widget, you can filter locations on a map. 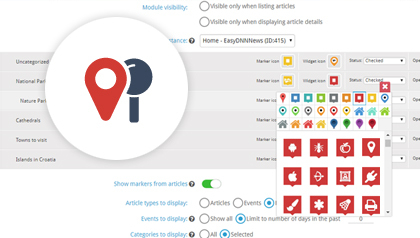 It is also possible to connect the categories from the EasyDNN News module to categories from the EasyDNN Maps module. 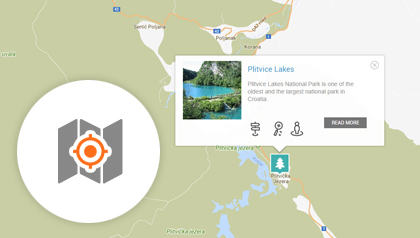 This functionality allows you to create advanced interactive maps. It is possible to search and filter Posts from the EasyDNN News module with the EasyDNN News Advanced Search. 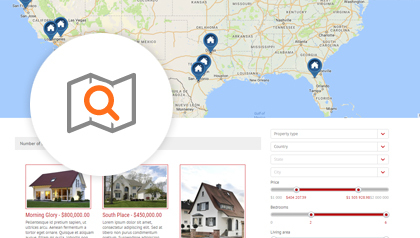 The search results can be displayed on a map so if you are searching for real estates, priced between 100 and 200 thousand dollars, only the real estates that match this criteria will be displayed on the map. Outstanding quality module! Very easy to use and it works great! Great on every device, rich features . Works great on DNN 9. Amazing support! Very cool module and great integration into their other modules. Awesome support!